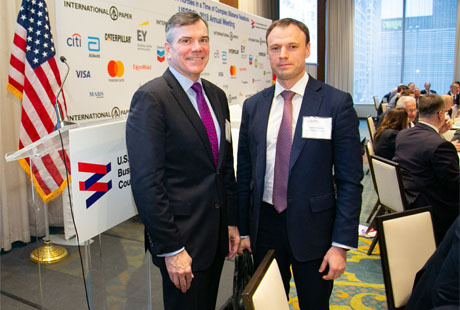 The U.S.-Russia Business Council (USRBC), based in Washington, D.C., with an office in Moscow, is the premier U.S.-based trade association representing the interests of its U.S. and Russian member companies on commercial matters. USRBC’s global approach is to work with a company’s headquarters as well any offices in the United States, Russia or regional capitals to advance a company’s bilateral trade and investment agenda. USRBC focuses on U.S.-Russian commercial relations, engaging in advocacy efforts with both the U.S. and Russian governments on behalf of its members; assisting member companies with strategic advice; providing information and analysis to support business decisions; and facilitating access and networking opportunities with government officials and private-sector leaders through an active program of high-level briefings and meetings. Recognized expertise in assisting businesses to successfully execute and develop business plans in the Russian and U.S. markets. Excellent relationships with both the U.S. and Russian governments offering unparalleled and timely access to key policymakers. Considered insights and knowledge to advocate informed private sector positions on behalf of member companies with U.S. and Russian policymakers on trade and investment issues. Trusted ally for individual companies and convenient umbrella for companies within a particular sector or across sectors on hot-button policy matters or longer-term sectoral initiatives. Valuable introductions to a vast member network in the United States and Russia, ranging from Fortune 100 firms and globally-oriented Russian firms to niche experts in the United States and Russia.